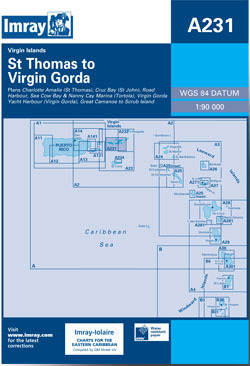 The Virgin Islands, St Thomas to Virgin Gorda. Scale: 1 : 88,300. Larger scale plans of Charlotte Amalie (St Thomas), Cruz Bay (St John), Virgin Gorda Yacht harbour, Sea Cow Bay and Nanny Cow Marina (Tortola), and Road Harbour (Tortola). Flat chart, water-resistant paper.